Ash Wednesday in Canary Wharf. Photo © Mazur/catholicchurch.org.uk (1). I would love to read more about the idea of wearing the ashes throughout the day. Since it is part of a religious ritual, there must be components of belonging and value. How does it differ from other outward symbols of religiosity like the Yarmulke or the Hijab? Does it differ at all? If they are indeed similar, why has France banned one and not all three? Religion is a slippery slope to climb in the public eye, but Will’s questions echoed a conversation S and I had following that post. While I am certainly not a religious scholar, we can investigate the power of symbols and the role of community in these types of observances. Rituals reveal values at their deepest level … men express in ritual what moves them most, and since the form of expression is conventionalized and obligatory, it is the values of the group that are revealed (2). Rituals thus come to reflect the particular sensibilities of communities—or rather, communitas, a term by Victor Turner used in The Ritual Process to represent the human bond (3). Communitas is distinct from the structured economic, political, and judicial systems that govern social life, and give us communities. It connects the unstructured elements of the social order: those dialectic processes where the social order negotiates itself—states of shifting, rebalancing, and reordering. In these moments before established structures assert themselves, actions, behaviors, and relationships are governed by communitas. This idea seems most closely represent the networks that we belong to because it groups us together in ways that are more intimate than the idea of a general community. If we use Turner’s concept of communitas, we have a means of understanding the connections within religious groups. While the term ritual often brings to mind religious grandeur, we are immersed in rituals. That quick pass through your home before you leave—the one where you make sure the stove is off and the windows and back door are locked—is a ritual. How do you start your workday? Do you need a cup of coffee and a quick review of the day’s headlines before you get down to email? Do you have a place you retreat to when you’re having a rough day or week? Have you sung “Happy Birthday” to a friend or loved one? Buckled your seatbelt on a plane or in a car? These are rituals. I draw attention to these mundane activities not to detract from the sometimes pomp and circumstance that surrounds many religious rituals, but to remind us that rituals permeate daily life, in ways that we may not even think about. Rituals are obligations. They are the means by which we perform and confirm our affiliation to social groups. Drinking a cup of coffee and reviewing the day’s headlines prepares us to participate in a culture of work. They signal our willingness to enter this phase of our day—that we’re workers—because they are done in specific ways at specific times. The are the means by which we confirm our participation in a particular activity—in this case, roughly eight hours of paid labor. The same is true of singing “Happy Birthday”: it signals our connection to the celebrant, indicating that we recognize him or her as a member of our network. Religious rituals function in the same way. Ash Wednesday marks the beginning of Lent: the forty days leading up to Easter that are a reflection of the forty days Jesus spent in the desert, during which he fasted and was tempted by Satan. The Lenten season is a time of penance and mourning, and as a symbol of this penance and mourning, Christians wear an ashen sign of the cross on their foreheads. The practice of wearing ashes as signs of penitence is older than Christendom: dusting oneself in ashes brings one low, signifying humility and sorrow. According to Wikipedia, there are also numerous mentions in various Biblical texts that discuss this practice in this context. While Ash Wednesday is not a Holy Day of Obligation within the Church—a day on which Christians are required to attend mass—many do participate, and the act renders Christians highly visible because they typically wear the ashes for the day until the mark fades. Ash Wednesday becomes an important means of establishing communitas within Christiandom because it provides Christians with a visible signal of connection, laying bare the links of a larger network. It is this network that the homeless woman we discussed earlier hoped to tap into. Though she herself did not have ashes on her forehead, she sought to link herself to this signal of the network—to no avail because she didn’t possess the actual symbol that she was trying to leverage. Rituals are most powerful and apparent during transitory states that precede our full participation in the social structures that govern daily life. When we’re having our coffee and reading the day’s headlines, we haven’t fully settled into our roles for the day. When we’re singing “Happy Birthday,” we’re in the midst of adjusting the network to account for the celebrant’s new status, which is tied to age. Ash Wednesday places participants in a similarly liminal state: it separates participants from the main social order, highlighting their connection to a particular network in preparation for the coming Easter observance. The use of ashes in this case helps the communitas manifest publicly, but the ritual itself remains powerful without the visible signal. S received his ashes on Ash Wednesday night, and during the accompanying mass, the priest reminded the congregation that the wearing of ashes is only meaningful if you believe in the ritual itself. That is to say, whether you get ashes at 8:00 am and wipe them off immediately or at 8:00 pm and could only wear them for a few minutes, if you accepted the meaning behind the ritual then your place within the network is confirmed. The visibility made possible by this sign is a byproduct of the event, but it is not the object of the performance. However, if this is completely true then the homeless woman’s lack of ashes should not have impaired her ability to obtain more assistance. I don’t think it necessarily did, but her personality is known in these quarters quite well and I think her statements may have been viewed as manipulative given the context. Cover your head in order that the fear of heaven may be upon you. The Hijab, which is a style of dress, is linked to modesty and morality in Islamic scholarship. Wearing ashes, a Yarmulke, or a Hijab is not done primarily as a means of identification. These actions are born out of obligations to the network. Furthermore, the Yarmulke and the Hijab don’t appear to fit our discussion about rituals. They aren’t elements of transition or preparation for participation in larger structural systems—they are embedded in structural systems themselves and as symbols, they take on completely different meanings and status in these contexts. (C)ommunitas is made evident or accessible, so to speak, only through its juxtaposition to, or hybridization with, aspects of social structure. Just as in Gestalt psychology, figure and ground are mutually determinative, or, as some rare elements are never found in nature in their purity but only as components of chemical compounds, so communitas can be grasped only in some relation to structure. Just because the communitas component is elusive, hard to pin down, it is not unimportant. Here the story of Lao-tse’s chariot wheel may be apposite. The spokes of the wheel and the nave (i.e., the central block of the wheel holding the axle and spokes) to which they are attached would be useless, he said, but for the hole, the gap, the emptiness at the center. Communitas, with its unstructured character, representing the “quick” of human interrelatedness … might well be represented by the “emptiness at the center,” which is nevertheless indispensible to the functioning of the structure of the wheel (4). 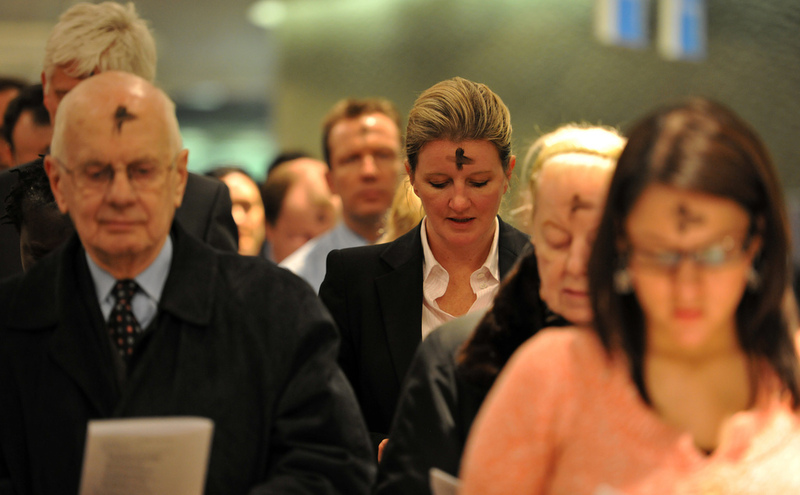 If Christians were required to wear ash crosses on a daily basis, the ashes would become a part of the religious structure, and would be subject to the struggles that occur between social structures as they assert and establish themselves. This appears to be what is occurring with the Hijab, which as a symbol has come to represent more than its original purpose both to external social structures as well as those for whom the Hijab is an aspect of daily life. It has become a symbol for the conflict between political and economic and legal systems. As it is, Christians wear their ashes for a day to remind them that they are entering a period of fasting, penitence, and mourning. Ash Wednesday is a day of liminality during which Christians are extracted from the general social order in preparation for the coming Easter holiday. Following Ash Wednesday, there are no visible markers that identify Christians as such—the communitas manifests and then dissolves back into the social order. This is not the case with the other religious symbols that were raised in comparison. I make no claims to be a religious scholar—the thoughts above are my own, reflecting what I have understood about ritual and function. I encourage Readers to consider the issues in this post and share your thoughts with the community here, but I’d also like to remind you to please be respectful in your commentary. Turner, Victor. (1969) The Ritual Process: Structure and Anti-Structure. Chicago: Aldine Publishing Company. 2. Turner, Victor (1969). The Ritual Process: 6. I also really liked how you stripped the concept of ritual of its particular religious meaning. Rituals are present everywhere in our lives, as you said. Despite popular misconceptions, they are not absolutely linked to religion. That does depend on your definition of religion, but I digress. I never considered the differences between a ritual that signifies a transition and a ritual that signals belonging -- singing happy birthday or drinking coffee versus wearing green on St. Patrick's day or the team jersey to a sporting event. Very interesting. Before beginning my religious studies I often assumed that community was community was community. The difference between community and communitas never occurred to me. Even now, after I realized that there is a difference, they are sometimes hard to tell apart. I also have a hard time remembering that belonging to a communitas implies a different set of responsibilities than belonging to a community. I really enjoyed the way that you described the differences between the two! I want to follow up on one point that you made in this article. I had the chance to listen to a young, female. Muslim lawyer in DC who, in high school, decided that she would "cover". She explained her decision in very moving terms. Her parents are also Muslims and neither of them modeled the covering behavior or forced her into her decision. I gathered from her discussion that she was wearing it as a means to signify that she is part of a particular religious faith. She understood that they are linked to modesty, but modesty was far from her primary goal. Rituals (secular or mundane) have a variety of meanings. I tend to agree with S's priest: the sign "is only meaningful if you believe in the ritual itself. " Thanks again for your great post. Keep it up!! This was a difficult post for me to write because religions are such complex systems, which is partly why I tried to direct the conversation away from the ritual tied to religion, and demonstrate that we can understand ritual in terms of our daily lives. This opened the door for me to think about rituals differently—in terms of networks rather than beliefs. I am very glad you found these ideas interesting. Your anecdote about the young, female Muslim lawyer you met demonstrates the subjective nature of religion, which is what makes it such a complicated topic! I like the ideas you have here, especially community vs. communitas. Can communitas apply to our connection with divine figures (in theistic religions) as well? Because some rituals - like the Eucharist - are not only focused on a connection with other people, but also with the deity. Furthermore, I don't see how this explains the cultural evolution of religion. I've just read a book by Patrick McNamara, The Neuroscience of Religious Experience, and he explains that ritual helps the individual move from a new self to an old self via a process of decentering - think William James' concept of the divided self. This use of ritual (as well as non-communal religious practices) as a tool for growth of the self explains why so many religions have it. My understanding of communitas is that it is linked to liminality, so that moment when the sub-network asserts itself is when communitas is most apparent. The Eucharist is indeed a ritual that works to connect individuals with a deity, but it seems more a manifestation of the religious community rather than the religious communitas—if that makes sense. Communitas removes the individual from the larger social order and prepares them for a coming transitory phase. The discussions surrounding communitas that most clearly explain this are in Turner's Ritual Process and it is no surprise that they deal with rites of passage. I was not attempting to explain the cultural evolution of religion, but rather the experience of a particular religious moment. McNamara's idea of decentering is actually fairly close to some aspects of communitas so I can see some connections there. Rituals also help give us a sense of control, which I think may explain why they seem to permeate so many aspects of life—including religion. After all, religion asks us to have faith in something that we can't see or touch or experience in a tangible way. Rituals help us substantiate some of the belief that we're asked to offer. Why Do We Hurry to Wait? Does Cooperation Really Make It Happen? THE OPEN LAB ANTHOLOGY IS HERE!